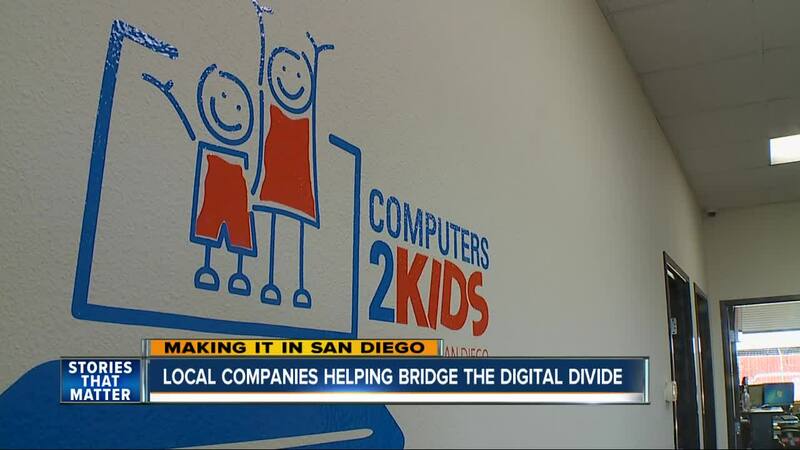 SAN DIEGO (KGTV) - A pair of local companies are helping low income families get connected to the modern world, offering low cost, or in some cases, free computers and internet access. Computers2Kids started in 2004 and distributed 354 computers. This year, they'll give out nearly 25,000. As the program has grown, they've also partnered with Cox Communications and the Connect2Compete program to provide internet access. According to CEO Cheri Pierre, nearly 25 percent of San Diego families do not have a computer in their home. That creates a "digital divide" making it harder for low-income families to apply for social services or jobs. It also puts their kids behind in school, as more and more classwork is done online. "Everyone has a cell phone that they can use to get on the internet," said Pierre. "But when you're trying to apply for resources, jobs, do homework, a cell phone really isn't an adequate tool." In addition to the computers, the programs offer basic computer and internet literacy training, a year of free tech support, Wifi and software. Pierre said the results are astounding. Students see their grades go up around two grade levels after they learn to use the computers. Cox Communications did a survey of the families in their program that shows 90 percent of students saw their test scores increase. The study also showed 88 percent of the parents say their kids became more interested in school. "There's a lot of things going on in their lives," said Cox spokesperson Ceanne Guerra. "Having computers and internet has made it easier for them and gives them a better feeling. They're more engaged and attentive to their education." Computers2Kids gets their computers mainly from companies who donate old computers after upgrading. Volunteers wipe the hard drives and refurbish the computers. They also get donations from individuals. Pierre and Guerra say eligibility depends on several factors, ranging from income to family size. To find out if you qualify, or to make a donation, contact Computers2Kids at c2sdk.org or send an email to info@c2k.org . You can also go to connect2compete.org/cox .